Last night, I noticed a small wet spot on the duvet, but we decided to sleep normally. However, at 7am, Phyllis woke me up because she had noticed the sound of water while breastfeeding, and true enough, my feet were wet. At first, we thought it was the radiator in my office that had burst, but checking the on-off timer on the boiler revealed that this couldn’t be the problem. So I went up to the office with some water and poured it onto the roof until Phyllis alerted me from downstairs that it was pouring in. It seems to be a wee crack on the side of the outside window ledge. The reason it started now must have been because the rain is coming from the east, which is unusual for the west of Scotland. I’ve tried to block the hole a bit, but I guess I need dry weather to do a proper job, so that we can reclaim our bed! A year and a half ago, shortly after moving into our house in Newton Mearns, we decided to buy a lean-to greenhouse. I found one on B&Q’s website at a reasonable price. I didn’t say anything about assembly, so I presumed it probably was reasonably easy. It arrived at seven big bunches of aluminium sticks and three packets of toughened glass. All I could do at the time was to check that all the packets looked unbroken. The next time I had a weekend available, I started building it. 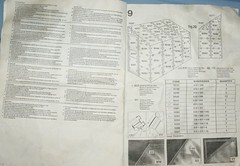 I knew I had to build some kind of foundation, but the instructions for that were too confusing without actually having a greenhouse frame to measure. It took a long time – the instructions were hard to follow, but at least each bit of aluminium had a number engraved that were matched somewhere in the instructions, so it was just a case of persevering. However, when I had almost completed the frame, I realised I couldn’t proceed without building the foundations, because some of the bits had to be screwed directly into the foundation or the wall. It was a rainy day, however, and the foundation involved pouring concrete into holes in the ground, so I had to wait till the weather improved. In the meantime, we had some very strong winds, and the frame started blowing apart. To rescue it, I had to disassemble it into sections and wait for better weather. Some months later, I finally got round to building the foundation and reassembling the frame, but by then it was too late to grow tomatoes and chilies, so I decided to put in the panes at some later date. A few months ago, I then finally got round to putting in the panes together with Phyllis. It was quite puzzling, however: Whereas the metal bits had been numbered, the glass was not, so we had to spread them all over the lawn, measure them and match them with a number in the instructions (I’ve scanned in the relevant page; note how the instructions on the left are for the illustrations on the previous page, just to confuse you). Because it was a sunny day, that process burnt huge holes in our lawn, but what could we do? 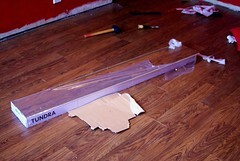 Doing this, we discovered that two panes were missing completely (they had delivered 2 panes of size 10132 instead of 4). Not broken, just missing! I therefore filled out the form to inform Halls. The form did say you were supposed to do that within 7 days of delivery, but how was I supposed to do that when the packets were intact? Should I have spread out all the panes onto the lawn for a year? I got a phone call a few days later. It turned out Halls had been taken over by another company, Eden (now called Eden Halls), and after a fairly long and pleading conversations, they agreed to send the missing bits free of charge. They arrived yesterday, and the greenhouse is finally complete! Next time I’ll either buy a polytunnel instead, or I’ll get somebody to assemble it for me. We’re in the process of moving the kitchen to another room. So far, we’ve got gas and electricity put into the new kitchen, we’ve painted the walls, Dougie put up new lights, and I’m nearly done laying a nice laminate floor. Today Ikea then delivered all the units – as you can see from the photo, there are a lot of boxes! I’m sure that will provide lots of weekend entertainment for the whole family for many weeks to come. We still have to buy worktops (we didn’t like Ikea’s), a sink, a tap, a cooker and an extractor hood. And finally, we’ll have to clear out the current kitchen and put up wallpaper and lay a nice floor. We’ve now stripped the future kitchen complete bare – I’ve even removed the laminate flooring. Next week, the plan says we’ll get an electrician and a plumber round to put in electricity, gas and water. After that, we just need to buy a kitchen and install it. Easy! So at the moment, we’ve browsing through kitchen catalogues to choose everything from worktops over taps to cookers. 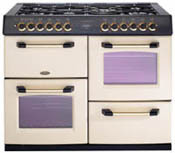 At the moment, the range cooker that is tempting us the most is the Belling Sandringham 110DF. It has a plain oven, a fan oven, a slow-cooking oven and a separate grill, as well as seven burners (including a wok one). Anything we should watch out for? In order to move our kitchen into the adjacent narrow room, we need to get a building warrant from the council. Till now, we thought we needed an architect for that, but Phyllis talked to them today and found out that they will accept a home-made drawing, so long as it is to scale etc. So now we just need to do it. But what shall we use? Pen and paper? Ikea’s Kitchen Planner program? Some fancy CAD program? 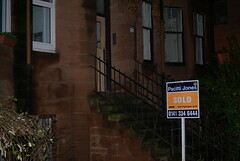 We’ve finally sold my flat in Rose Street!!! The offer came in six weeks ago, but the missives were only signed two days ago, and the money didn’t reach my lawyer till today, which is why I’m only blogging it now. We got £2000 less than the fixed price we had asked for, which is not too bad considering the state of the house market in the UK at the moment. I’m now off to my favourite restaurant to celebrate! Author thomasPosted on 2008/01/11 Categories DIY, en1 Comment on Sold! I floored most of the flat using Ikea’s fine Balk real wood floor, which looks great and was easy to lay (although it has a slight problem with widening gaps between the planks in busy areas). In the kitchen, I used some kitchen laminate from B&Q that looks like tiles and again was easy to lay and looks great. In the house we needed to put in a new floor in Marcel’s room (due to a mixture of brown and pink carpets), and he liked Ikea’s brown Tundra which is very cheap but which Phyllis claims to have had good results with in the past. It was a complete disaster, however. The planks just didn’t want to click together as they should. I know the floor wasn’t as even as it should have been, but this was horrendous! And while trying to make them click, they would get all chipped, so the whole floor looks like a dog’s dinner now. Fortunately Marcel doesn’t seem to mind, though. I just wish I knew whether a more expensive laminate would have been less sensitive to the unevenness of the floor.